Once you’ve had chickens for a while you may want to experiment with making your own animal feeds. Making your own may not necessarily be cheaper, but you can use local and highly nutritious ingredients. Most conventional animal feeds rely heavily on corn and soybeans as the main ingredients. Unless you are paying for a high priced feed that is tested as being GMO free, your chickens are most likely eating genetically modified ingredients. Some people have no issues with GMO corn and soybeans, but others would prefer to use heritage varieties. Luckily making your own animal feeds is not super difficult! Last winter I came across a GMO free feed recipe and I was super excited. I had already switched the goats off their prepackaged feed but was hesitant about phasing out the layer feed. I ended up switching all the animals to a feed mix and I am very happy with the results. Our chickens are having the easiest molt ever, the goats are sleek and shiny, and the rabbits are looking good as well. I did make some personal tweaks to the recipe so the nutritional content is not exactly what is posted on the link. If you are interested in mixing your own feed at all check it out! Since then I’ve done more research and made some modifications to our feed to really optimize it. The mix I started out with is one part split peas or lentils, one part flax seeds or sunflower seeds, one part barley, and one part oats. I buy these in bulk from Winco or the feed store, where ever I happen to be shopping when it’s time to bulk up. Since switching I realized that the chickens will pick through the mix to find their favorite items. Invariably this leaves behind a lot of split peas and lentils. If you want to keep using the split peas, grind the mix, add water, and feed daily as a mash. If you are using lentils, sprouting them usually motivates the chickens to gobble them up. Sprouting is super easy, simply soak the seeds over night and then rinse daily until fed. If you have the space you can even green it up for fodder. (Related Post: Fodder Feeding: How To Get Healthy Livestock AND Save Money). You could also mix the ingredients together with molasses, which is especially good for goats. Recently I’ve switched to using sunflower seeds as the main protein source, in addition to alfalfa (if you can find a GMO free source…) for the rabbits and goats. The barley can be swapped for wheat berries or cracked corn in the winter. The goats can eat whole oats, but the rabbits and chickens will absorb nutrients better if they are rolled or sprouted first. Recently I’ve been adding flax meal and a handful of salt to the mix for extra nutrition. You will need to add supplements in separate dishes to make sure there are no nutrient deficiencies. The goats and rabbits will need minerals, and the goats will need baking soda. The chickens need oyster shell for additional calcium. Ground kelp is a good source of copper and other nutrients, and my chickens and goats come running every time I refill their kelp bowl. It’s also very important that your animals get fresh live foods daily as well as high protein ones. the best option is pasture or forage. You can even pasture your chickens on your lawn! 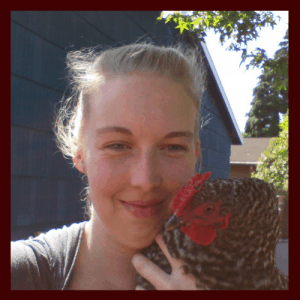 (Related Post: Pastured Meat Chickens In The City). If that isn’t a possibility, you can still grow foods and bring them to your animals. Extra garden produce such as beets, chard, squash or cooked potatoes, comfrey, and even weeds like nettles and dandelions are highly nutritious and delicious to our furry and feathered friends. If you plant cover crops you can cut them for feed or let the animals come to the garden plot in a tractor or temporary fencing. Some good options are kale, turnips, radishes, buckwheat, and clover. Some grains can even be grown in small spaces such as dent corn, broom corn, or amaranth. Left over fruits or ground nuts make good chicken and duck feed, and worms, slugs, Japanese beeetles, kefir or leftover dairy are great for added protein. Chickens are also happy to eat extra eggs (hardboiled0, and even offal and blood left over from butchering your rabbits. 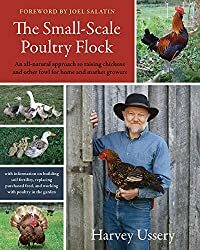 The book The Small Scale Poultry Flock dedicates a great portion of it’s chapters to discussing replacing purchased feeds. If you want to get away from buying both premade feeds and purchased grains I highly recommend it. If you want to learn more about animal nutrition National Academies Press offers a free download of the Nutrient Requirements of Poultry. It’s very technical, but very informative. I have it downloaded to my phone’s Kindle app so I can read it when I’m out and about if I’m so inclined. 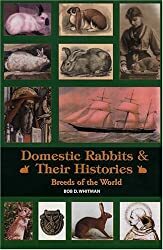 Domestic Rabbits & Their Histories by Bob Whitman has some great detail on alternative feeding of rabbits. Storey’s Guide to Raising Dairy Goats has an entire chapter dedicated to goat nutrition and formulating your own feed mix. Langston University has a calculator for balancing the nutritional profile of your goat feed. You can also check out the recommended books on our resource page! Go Make Your Own Feeds! 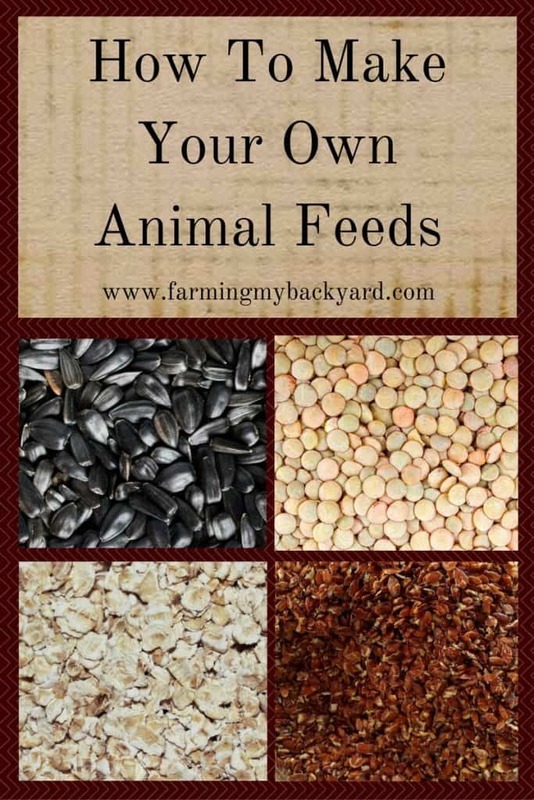 I love being a little more independent and able to mix my own feeds and make sure my animals get the highest quality feed without having to buy expensive and hard to find feeds. It can be tricky keeping the nutrients in balance, but I find it worthwhile. Do you mix your own feeds or do you prefer the ease of prepackaged? While I have not been able to source gmo free bales of alfalfa, I do shake out the flake when breaking pads off the bale and feed the leaf instead of oyster for calcium. I am concerned about the mercury in the oysters. I also use plain organic yogurt in the mix for a calcium boost. I hadn’t thought about mercury, ack! I bet yogurt would hold in the flax meal really well. How much money do you save making your own feed? The cheap feed was I think $15 for 40 lbs at the closest store, and the organic non-GMO was closer to $30, but they frequently ran out of the higher quality feeds. My homemade mix comes in closer to $30 for probably 75 lbs not including supplements like minerals and kelp. It’s not cheaper than the cheapest brands, but it saves money on the quality stuff. Would you mind sending me your chicken feed recipe, along with supplements. We have our little suburban farm in Columbia County, and I would really like to get away from commercial feed for our chickens and quail. Your ingredient list looks fantastic. Thanks so much. The exact proportions can vary depending on what your animals need, and what part of their life cycle or reproductive cycle they are in, and the quality of your hay or pasture. What I use varies depending on what is in stock at the feed store, and how much I let them out to forage. This week the feed bucket is 2 parts sunflower seeds, one part wheat berries, one part barley, a few cups of flax meal and a handful of salt. My hens are laying a lot at the moment so I’m also giving them a lot of meat scraps from leftovers to increase their protein, and quite of bit of grass from weeding out the garden plots. Chickens also have access at all times to ground oyster shell and kelp meal. I do not know about sheep. My goats did well on alfalfa hay and rolled oats when in milk. The mix I started my chickens with was one part split peas/lentils, one part flax seeds/sunflower seeds, one part barley, and one part oats. It’s a good idea when making any changes to track egg laying and milk output so you can see how your animals do on the new feed. What is your stance on rabbits and,corn in their diets? It seems so controversial! I just got two silver fox does and one buck, starting them in a small colony and expanding. My other buck has his own pen. Trying to get them on a natural feed in their natural setting….what is your rabbit mix of feed? There do seem to be a lot of ways to feed rabbits, and many of them work well. I have fed pellets to my rabbits, but I’ve also fed them rolled oats and alfalfa and they’ve done well too. I’m sorry, I have no experience with cattle. You may want to check out Abundant Permaculture https://abundantpermaculture.com or North Country Farmer http://northcountryfarmer.com/ as they have raised cattle for some years.